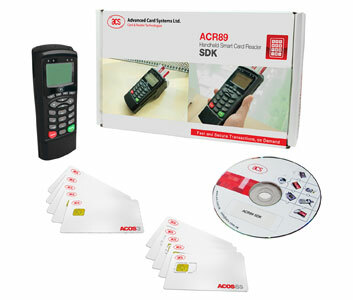 The ACR89 from ACS is a highly secure, programmable, handheld smartcard terminal that combines a high resolution graphical LCD, 4 LED status indicators 2 full size landing and 3 SAM/mini-SIM slots. The ACR89 is a replacement to the popular ACR88 unit, featuring a longer battery life with a rechargeable Li-ion battery, USB firmware upgradability, larger programmable memory and a high performance 32-bit RISC processor. The ACR89 SDK provides a complete package of documentation, sample code and connection cables to accompany the included reader. Power: PC-linked mode Automatically switch to USB bus power, always ON. ScriptBuilder - allows you to create, compile and download scripts to the ACR89 device. A highly secure, hand-held terminal with a graphical LCD, keypad and two contact smartcard slots as well as 3 internal SAM slots. Large programmable memory. Firmware upgradable. SDK also available.